The O2 Dome in London - arena for live concerts and sport etc. Go to a concert at the O2 ! 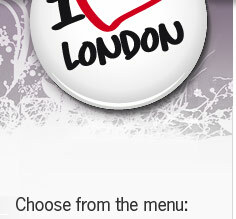 Be sure to check if any artist that you would like to see are in London while you're there, buy your ticket in advance. ... such as Elton John, Tina Turner, Bon Jovi and Justin Timberlake and many many more. 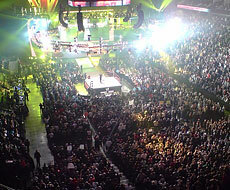 When 02 is not used for pop and rock concerts it transformes into a powerful sports arena. In the O2 much of London's entertainment are gathered under one roof. You can go to concerts with superstars and sporting events but also musicals, exhibitions, fairs and you can even take ski lessons in there. Coming to the O2 Dome 2017! 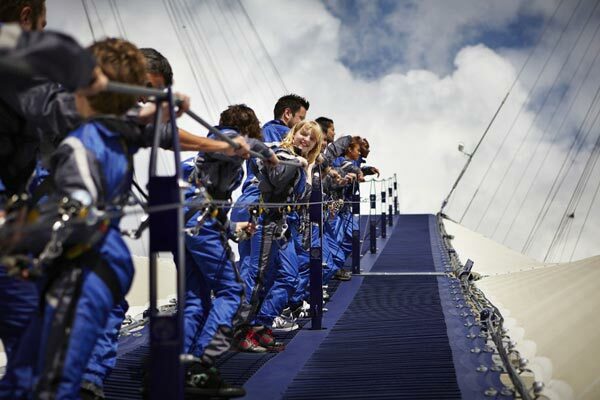 The O2 was built for the millennium in 2000 and was then called the Millennium Dome or the Dome. On December 31, 1999 there were held a private opening and the day after January 1, 2000 the Dome opened to the public with the exhibition "the Millennium Experience" - a tribute to the new millennium. The success that was predicted never appeared and after 1 year the Dome was closed and kept closed for nearly six years with some exceptions for opening at some special occasions. 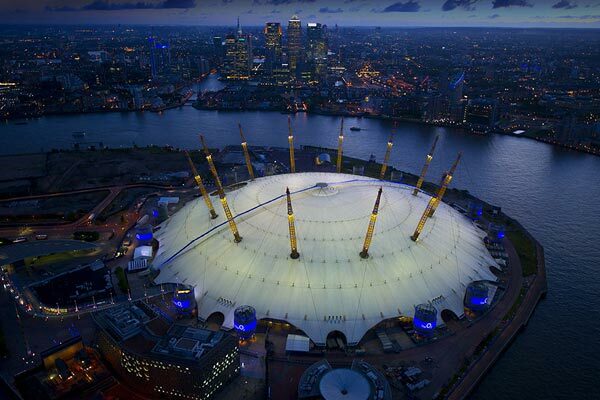 31 May 2005 the official name of the Dome changed to the O2 and on 24 June 2007, the O2 opens as the entertainment center it is today with a concert by Bon Jovi. During London Olympic Games 2012 the O2 were an olympic arena. Hike up the famous London O2 arena. 380 m long and 52 m high you walk on the roof. 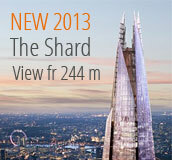 There is also an observation platform where you have a 360 ° view over London. A cool experience! Booking info: When you book tickets to Up at the O2 - fill in the date and then choos the time when you want to go. Minimum age 10 years. Minimum length 1.2 meters. Security: A climbing guide will welcome you and go through safety procedures. You get clothing and safety devices to take on and shoes if necessary. The guide is with throughout the walk. More tickets to the O2 Arena in London! The O2 has an overall diameter of 365 m - 1 m for each day of the year - and the highest point inside is 50 m.
The 12 steel masts are 100 m high and represents the year's 12 months or 12 clock hours . 18 000 double-decker buses can fit inside the O2. If you turned O2 up side down, it would take Niagara fall 15 minutes to fill it with water. The Eiffel Tower could fit O2 if it's lying down. The Thames Clipper boat service, takes you from central London to the O2 easy. The Catamaran departs every 20th to 30th minute from the various piers. On board they serve food and drinks, they have nice seats and toilets. Take a trip on the Thames combined with a nice view. Hop on and off as much as you like during one day.